Normally, in a coaching carousel post, I show how the outgoing coach compared to his predecessors. However, Arkansas isn't a normal situation. Bielema won't ultimately be compared to John L. Smith. He'll be compared to Bobby Petrino. So, for the Arkansas charts, I'm combining the Petrino and Smith tenures into one. 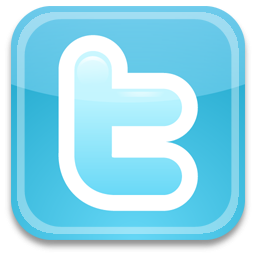 Let's delve in. Houston Nutt's Arkansas teams played solid defense, and Petrino's teams (08-11) never really came all that close. Granted, when you're scoring as quickly as Arkansas did in the Mallett/Wilson era, the defense isn't going to be as well rested as you'd like. 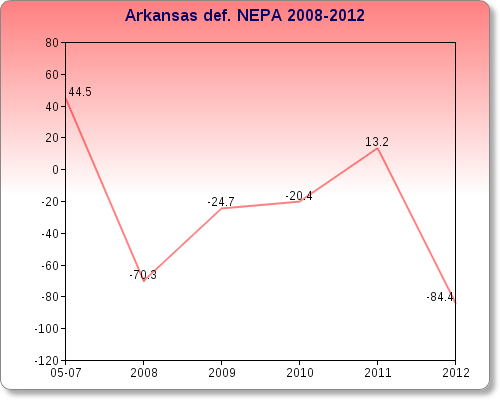 Still, when Arkansas lost from 2009-2011, the defense was usually the culprit. 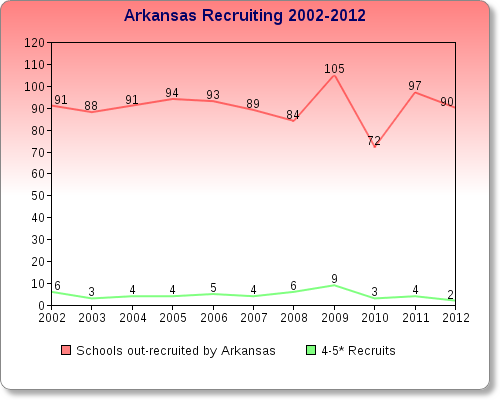 Arkansas is almost always in that 20-40 range in recruiting. There was a bump after his first year, with the '09 class, but for the most part, he kept things steady. At first Petrino did a better job than Nutt in bringing in elite talents, but since things have gotten back to around where they were under Nutt, or even a little worse. Now, with the timing of this column, we know the replacement for Petrino/Smith to be Wisconsin's Bret Bielema. It was a pretty surprising move, considering Bielema's contempt for the SEC's recruiting practices. At Arkansas, he'll need those recruiting practices to succeed. Over the last 4 recruiting classes at Wisconsin, Bielema has signed 77 players. Arkansas has signed 110. The Big Ten works hard to prevent the generally unethical practice of oversigning. In the SEC's Wild West, Bielema will be asked to embrace it. That should be fun to watch over the next two months. That's Arkansas in red, by the way. 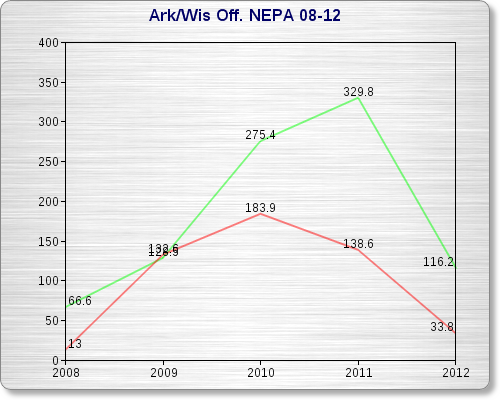 Wisconsin's offense has been off-the-charts good in recent years, better than Petrino/Smith in every year except 2009. Brutally effective on the ground, complemented by an efficient passing game, Wisconsin has enjoyed one of the best offenses in college football over the last 4 years. Granted, Big Ten defenses aren't quite as talented as SEC defenses, but by the same token, Bielema didn't have the pure offensive talent that he might enjoy in the SEC. His system will be easier to adapt to as well. In his first year at Wisconsin, the team saw immediate improvement. 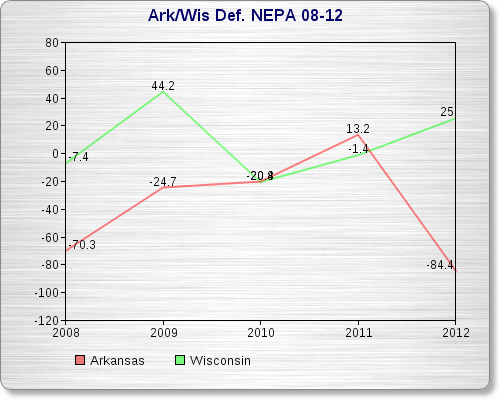 Unfortunately, NEPA doesn't think Bielema's defensive reputation should be much more sterling than Petrino's. Bielema's defenses have clearly been more efficient over the last 5 years, but not in a particularly notable or relevant manner. Is he going to improve on Petrino's defenses? Probably, yes. 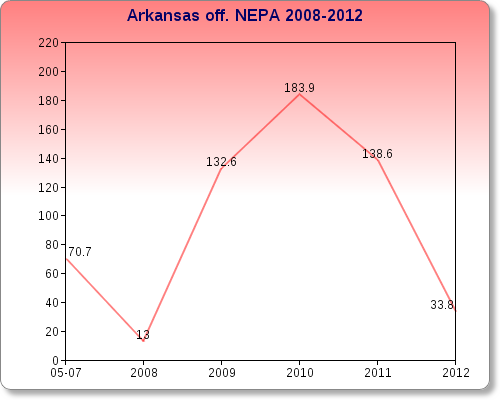 Is Bielema going to restore the defense to its Nutt-era performance levels? I see no reason to think he necessarily will, considering Nutt's 3 year average from '05-07 (44.5) was better than Bielema's best defense of the last half decade (44.2). And unlike Petrino, Bielema can't blame quickness of scoring. While Wisconsin certainly has their share of long plays, their reliance on the running game has contributed to consistently high times of possession. Overall, it's not a bad hire, but it doesn't strike me as a slam-dunk one either. Maybe it's the pure weirdness of the whole thing. Bielema is a good football coach - I have little doubt of that - but my real questions boil down to how well he'll immerse himself in the SEC culture that in the past, he didn't respect.